If you’ve been following us for a while, you know that we love to talk about kitchens. All types of kitchens. Truth is, the kitchen is a unique sanctuary, a place where secrets are sometimes shared and often where heart-to-heart talks abound. Think sharing a glass of wine in the evening with the love of your life talking about what happened during the day or dreaming of your next vacation. 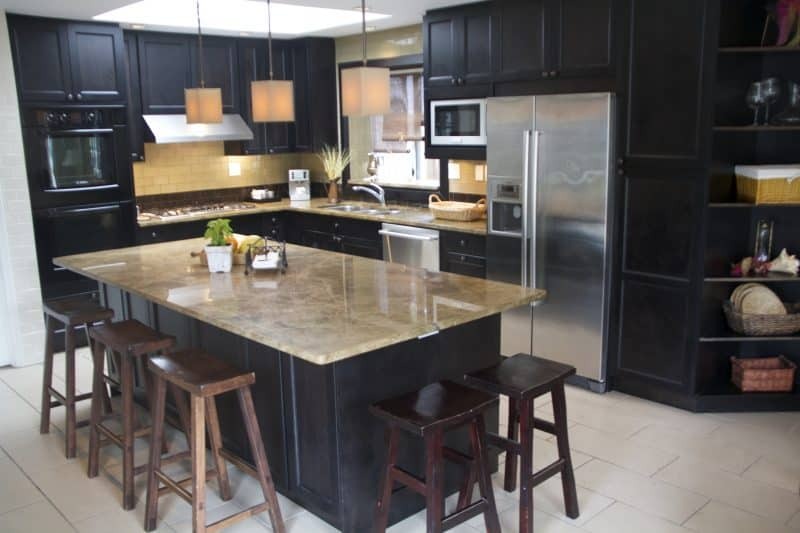 Today, we’re going to focus on dark cabinet kitchen ideas. 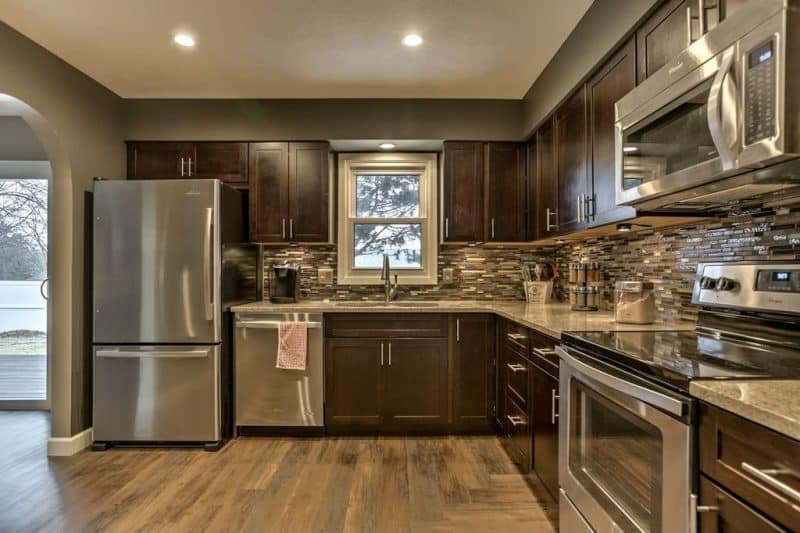 Now, don’t think that because a kitchen has dark cabinets that it will be somber and cold. In fact, quite the opposite can be true as you will see from the photos we picked below. 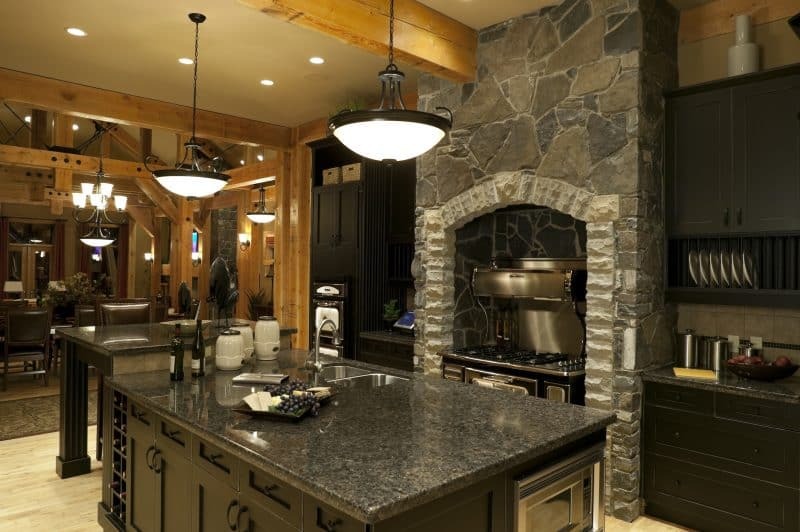 So here are some dark kitchen cabinet ideas for you to consider. Whether you are building your home for the first time or thinking about doing another renovation project to spruce up your kitchen, we hope these photos will inspire you…even if just a little bit. Enjoy and beautiful day to you. The Little Plus: hints of black, gray and ecru make this kitchen radiate with a unique simplicity that evokes both sophistication and elegance. Notice how the matte black built-in cabinets are not only useful for storing but also open up the space with its lit up display cabinets going up to the ceiling. 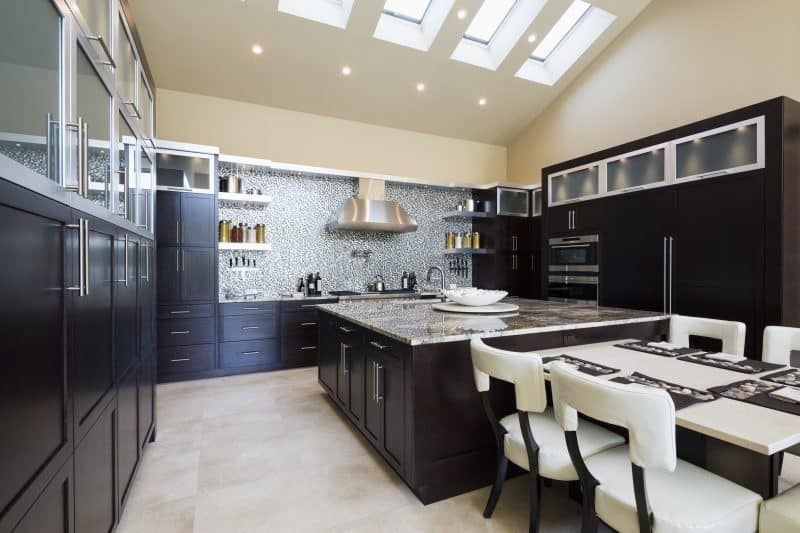 The room’s minimalist and modern lighting fixtures blend well with the sleek modern kitchen appliances. 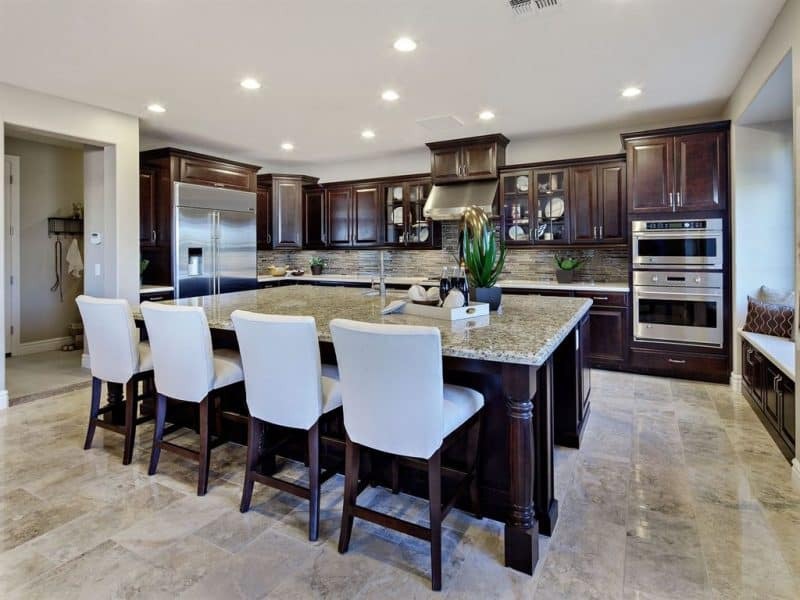 Old and new design marries harmoniously in this room, with the granite-topped center island surrounded by white cushioned stools promising a quaint yet elegant dining experience right in the middle of your kitchen! The Little Plus: the black center island with a white granite countertop takes center stage in this large planked hardwood floor kitchen. The red brick arch brings a whole new dimension into the space while drawing attention to the solid black stove nestled within. And how about the window above the counter — adding extra brightness to the room. And you can almost hear the crackling of the wood fireplace next to the oven, as the red hues of the bricks and the various browns of the wood floor mesh to create that warm and cozy atmosphere. 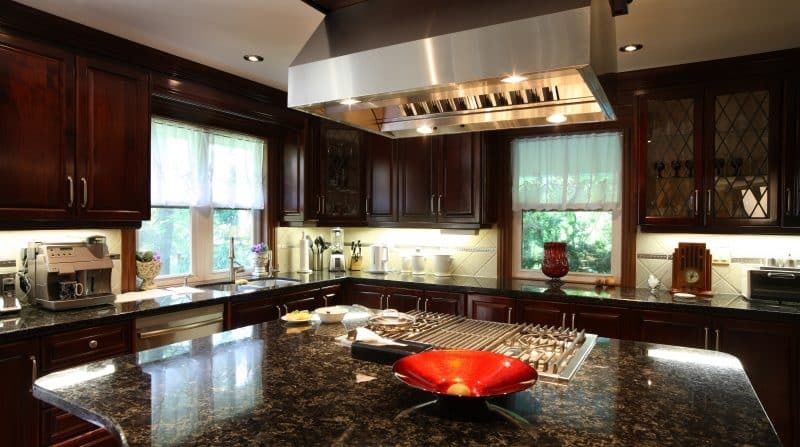 The Little Plus: the stainless ceiling-mounted range hood — it is a great companion to the dark granite countertop and adds a nice contrast to the overall the dark cherry color scheme. And thanks to two windows with sheer half curtains, some natural light can come in to brighten your morning. 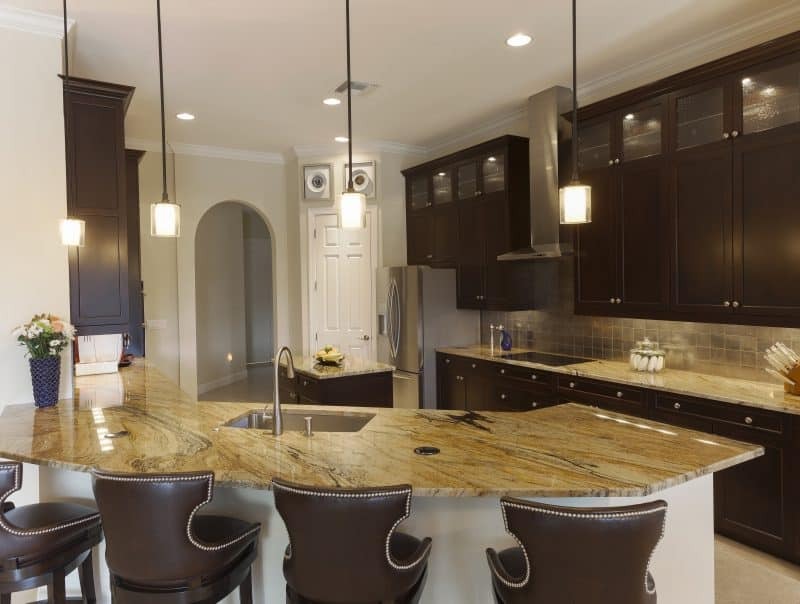 The criss-cross mullion glass cabinet doors on the right contribute to lightening up the cabinetry as well. Also, notice how that vibrant flame ceramic bowl illuminates the cooking area — a nice accent. The Little Plus: the polished marble kitchen floor — it helps to lighten up the room while tying in with the granite island countertop and the glass mosaic backsplash. And notice the storage bench on the side — very practical and the pillows add a softer touch to the kitchen. The high back ecru bar stools contribute to the elegant feel of this space. The Little Plus: the sparkling light blue backsplash adds visual interest and contrast this very modern kitchen and is a great backdrop of the stainless steel range hood. The skylight on the vaulted ceiling illuminates this backsplash like the sun on the blue ocean — so fresh! 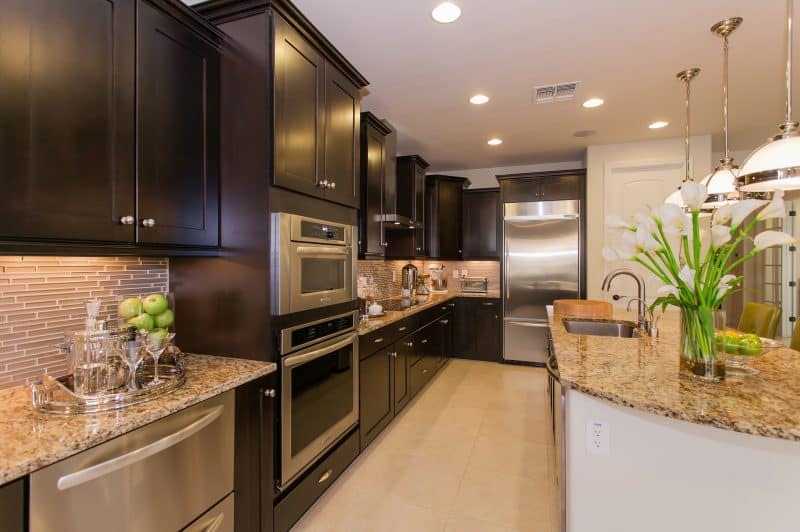 And notice how the dark cabinets have frosted glass doors near the top — providing a transition to the vaulted ceiling. The Little Plus: the sepia subway tile backsplash. It warms up the room and ties in with the earth-toned marble countertop and cube-shaped light pendants. Also. notice the wicker baskets on the corner shelves that offer extra storage with a bit of a country home style. The Little Plus: The black wood cabinets do not only provide sufficient storage for your everyday kitchenware but it also adds emphasis to that specific area of the space. The hanging cube lamps do its job to render some funky, design aspect in the room. Simple as it looks, this kitchen is brimming with warmth and character, right down to the wooden stools around the countertop and those wicker baskets that offer extra storage and a bit of a country home living vibe to the space. 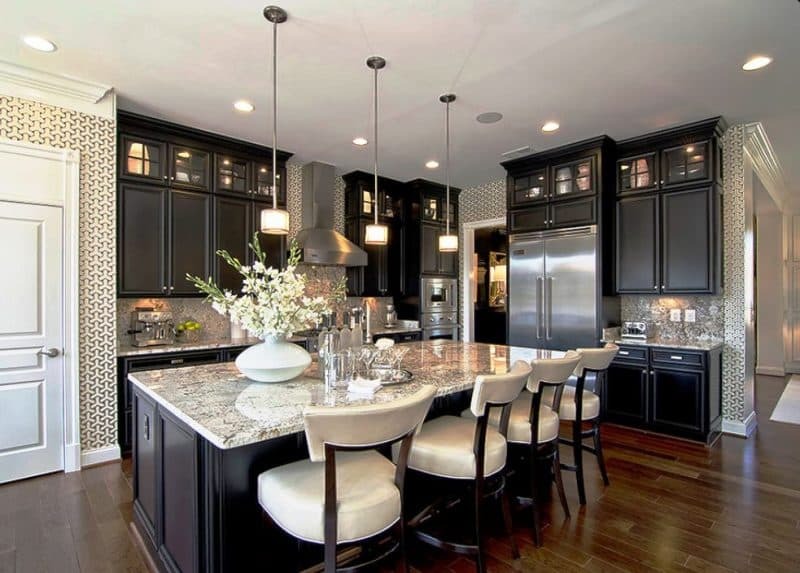 All in all, the solid black cabinets serve as the perfect frame that ties every element of this kitchen together. The Little Plus: the shape of the kitchen bar which optimizes the use of space. The flush cooktop contributes to the streamline design of this kitchen and doubles up as extra counter space — not a bad idea. 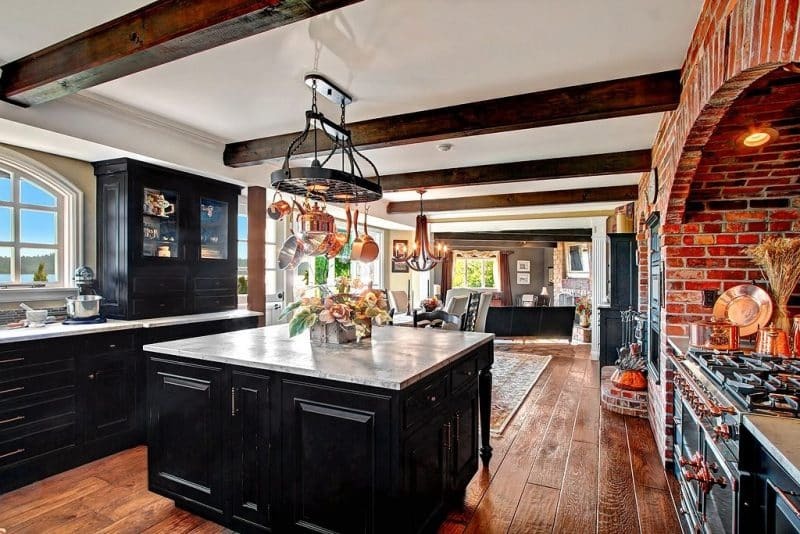 Also, notice the tavern leather stools with nailhead accents which add visual interest and a touch of personality to this more traditional kitchen. The Little Plus: the earth-toned glass and stone mosaic backsplash adds emphasis to the L-shaped countertop. Also, the laminated wood floor lends its warmth and charm and partners nicely with the cabinetry in a darker wood stain. And to tie the color palette together, the homeowner painted the arched wall and wall above the cabinet in a dark gray with green hues calling back the stainless steel appliances and dark cabinets — completing a forest of colors.